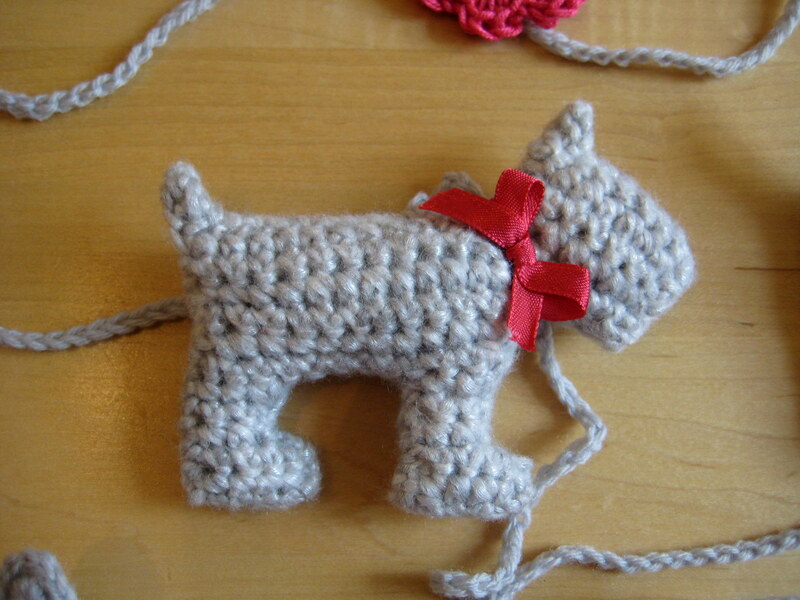 I spotted these cute little dogs on Ravelry, and managed to get myself in the testing pool for the pattern. I’m really pleased with how they came out! 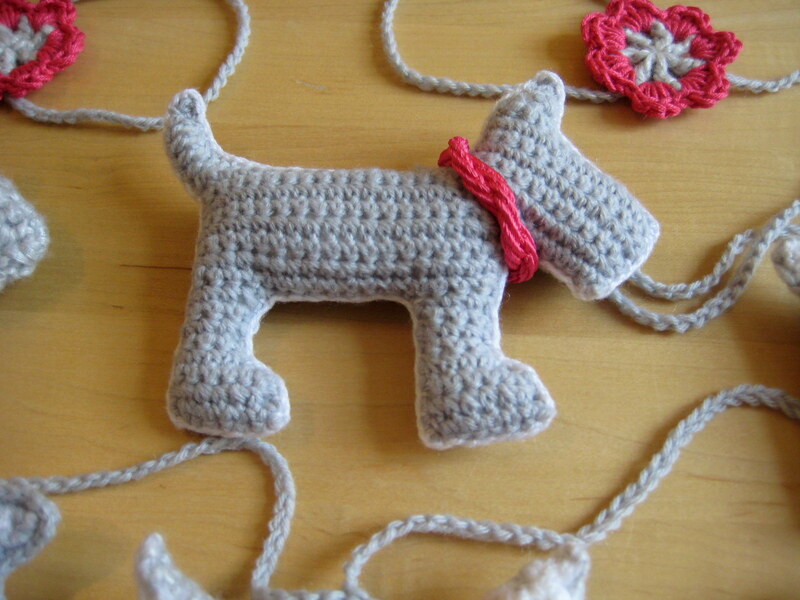 The dogs come in 4 different sizes so you can even make cushion sized ones. I made the small, medium, and large options, but used decreasing hook sizes with each size up so that they came out roughly the same size for my garland (details below). 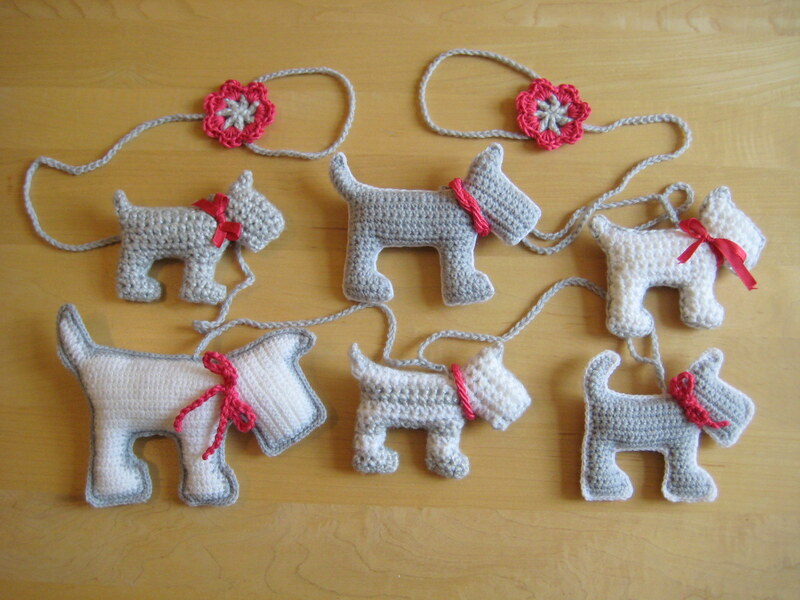 To make the garland, after I had made the dogs I used left over yarn to make a chain. First I chained enough to make a hanging loop and joined with a sl-st, then chained a length before joining the first dog, which I did by inserting the hook in the edge in the place where I wanted to join and slip stitching. Then I slip stitched back up the chain to give the dog a bit of drop beneath the main chain. Then I just repeated with all the dogs and finished with another hanging loop. To make the flowers I used 2 rounds of my flower pattern (available here) in the same pink yarn I used for a couple of the bows. I attached it by crocheting over the hanging loops as I went but you could just sew it on if you prefer. I enjoyed making this, and may make it again using blue or brown colours instead of pink for a baby boy gift. Or maybe even try making a mobile! Really sweet little pooches, they look great as a garland making a nice change to flowers. Would also work well for a little boy. Gah! Too darned cute! What a fabulous idea! Followed the link to yur blog from Ravelry…nice to find you! Oh, this is great! We had a Scottie when I was growing up, I may have to make something like this for my mom. It’s a nice pattern, and quick for the smaller sizes too! Do you have a pattern for the scotties? they are darn cute and a co-worker (elderly lady) has scotties, she trains them and takes them to shows, unfortunately, she just had an open heart surgery and I would like to make her something special. Let me know!